When it comes to travelling, it’s every photographer’s dream to capture the immense beauty of the world. From frozen lakes, beautiful crystal-clear waters of tropical islands, exotic animals in the savannah and the architectural beauty of palaces in distant lands, the world is a mysteriously enchanting place. And Russia is no stranger when it comes to heart-captivating scenery. Known as a winter wonderland, the country has so much to offer to tourists and photographers from all over the world! If you want to capture the immense beauty of Moscow, Sparrow Hills is the perfect spot to achieve this. It’s a university that is known as Stalin’s ‘Seven Sisters’—one of the first Soviet skyscrapers, peaking the Moscow skyline. It also serves as a park for students and as a favorite hangout place for locals. If you want to capture the city covered in snow, the view from the top of the building covers different distances and you will be able to capture the city’s best tourist spots without interruption. Krasnyoktyabr translates to ‘Red October’ and used to be a chocolate factory, known for its product, “Alyonka”. It is now one of the most popular hubs of the cities, where youngsters gather to hangout. It is also one of the warmest places in the city. The building itself is a sight to see—red, classical and magnificent. It’s the perfect place to photograph and visit galleries, boxing clubs and meet creative souls. The park was built in Soviet Russia and had several Soviet-designed architectures. It has recently been revamped and cleaned. The Soviet attractions have been remodeled and several cafés have been opened. The locals gather to play ping-pong, chess and the park even hosts dancing lessons to dance enthusiasts. It is the perfect place to capture the beauty of modern-day Russia. It is also the place where the biggest European ice-skating rink is! The park is quite small and cozy but it’s the place to find the best Russian food and music. It has a small play area for children, several restaurants and even hosts concerts from time to time. The place is full of families who visit regularly. It hosts festivals as well but perhaps the beauty of the park is that no matter how small it is, it never feels crowded! Contact us today to avail hotel discounts and to get a Russian visa invitation letter! St. Petersburg holds great intrigue and wonder for history buffs, architecture majors, and European art lovers. In fact, this incredibly captivating city would surely win the title of ‘most beautiful’ among rest of the great cities in Europe. The city has experienced much during its 350 year-long history that gave rise to the St. Petersburg we know and love today. Visitors to the historical city can see much of its arduous and bitter narrative, hidden in every street, park, gallery and museum. Majestic and vibrant to its very core, St. Petersburg is home to some of the world’s best museums that offer something for every visitor. Enjoying the status of being one of the oldest museums in the world, the State Hermitage Museum houses the largest collection of paintings. 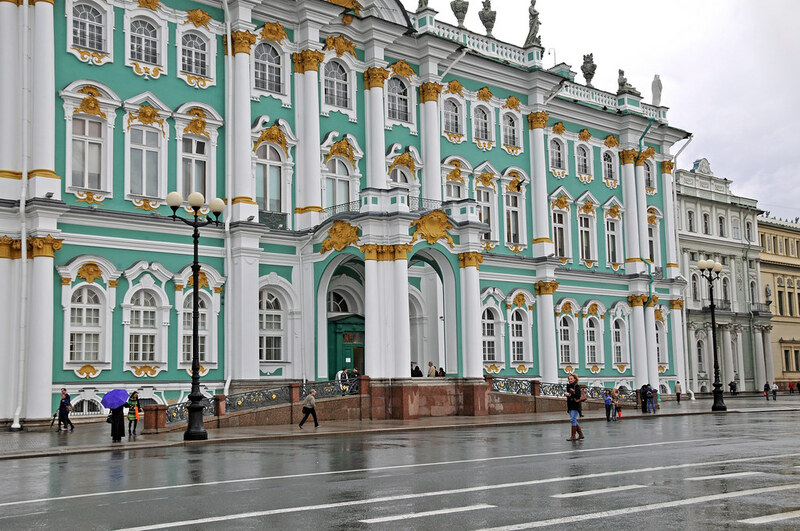 Founded by Catherine the Great in 1754 and open to the public since 1852, the museum comprises 6 historical and beautiful buildings that include the Winter Palace. Not all museums in St. Petersburg offer visitors a cultural experience. The Upside-Down House belongs in the latter category. However, this unusual museum manages to incite thought-provoking responses. Completely flipped upside-down, this popular attraction has every reason to be one of the most visited in the city! Walk inside the house for an experience filled with disoriented bewilderment. Bonus: You can take pictures. Here, you will find over 400,000 exhibits to bask in, ranging from 12th century to 20th century iconic artistic displays. Inspired by Russian art and culture? Wish to know more about this city’s long history? Visit the splendid and magnificent Mikhailovsky Palace, known to be the treasure-trove of the best Russian art from all periods. The fine arts are celebrated in St. Petersburg. In fact, the beautiful city offers numerous places for art lovers to gather and enjoy artistic endeavors of the 18th and 19th century. One of the oldest in the city and Russia, Museum of the Academy of Fine Arts provides a unique respite for art lovers as here they find different collections of sculptures, paintings, mosaics, antique models, statues and art replicas. A treasure trove of history, art and culture and everything in between—St. Petersburg offers visitors a cultural experience not provided anywhere else in the world. Visit and explore to your heart’s content. Stay at the best and most affordable hotels, even if you have planned this trip at the last minute through Go4Hotels! When you’ve gotten the visa for any country, the first thing you should do is double check all relevant information. This specifically includes personal credentials, like the spelling of your name and other details. Visas can appear intimidating at first, but when you know your way around it, it’s not a big deal. Reading a guide about it can give you the basic guidance to locate all essential information. Keep in mind that Russian visas have a very specific validity date and are not applicable over a “travel window” like other visas. Hence you need to know the exact dates of your trip and considerable shifts in dates will not be accommodated. The Russian consulate issues visas in two major formats. This appears as a sticker pasted onto the blank pages of your passport. Make sure, they are free from any other visa stamps or marks so that the consulate does not have any hindrance in using it. The new style Visa is pale pink in color with a hologram impress. Usually it is issued in Asian countries along with UK, Europe, Australia and North America. The older version does not have the hologram impress and is issued in Russian consulates located in remote areas. The main prerequisite when travelling to Russia is to receive a Russian visa invitation and voucher to proceed with your visa formalities. This also depends on the motivation behind your trip, whether it is a business trip or solely for the purpose of entertainment. Business Visas are basically intended to authorize foreigners who are visiting Russia for business purposes. This could be in lieu of attending a business meeting, signing a partnership contract or carrying out negotiations. Depending on the nature of the business, the Visa issued will be single, double or multiple-entry. To begin with a student Visa process, one needs an official visa invitation from an authorized organization in Russia itself. This could be the school or university that the student is going to attend. The visa type is single-entry and is valid for the entire tenure of your student life in Russia. Issued on the basis of single and double-entry, it is granted to people wanting to visit Russia. The tenure of validity is limited to 30 days. A tourist invitation and an already booked accommodation is a must have to obtain this type of Visa. This is the one which is most frequently applied for. People travelling to another country via Russia are issued the transit visa. This has a validity of maximum 72 hours and can again be either single-entry or double-entry. These can be obtained easily and are relatively cheaper than the other types of visas. Your travel documents need to submitted, along with the visa copy of the final destination to qualify for a transit Visa. Receive a Russia visa invitation and voucher for your Russian Visa from a reliable and authorized organization. Contact destinationRussia now! For most nationals to be able to travel to Russia you will need to obtain a Russian Visa before you can travel, the process can take from 2 days to 3 weeks depending on the type and time of year that you apply. The cost to expedite your application can be quite alot, so its best to plan in advance and obtain your visa in plenty of time. In order to travel to Russia you first need to obtain an Invitation or Visa Support voucher from a licensed Russian Travel company or Hotel where you will stay.. You need to obtain this voucher which will show the date you enter and exit Russia. Most hotels will only issue the voucher for the date you intend to stay with them, and most charge a fee for this service. We recommend destinationrussia.com who can provide the documents you require at a minimum cost and can cover the whole stay in Russia regardless of which Hotels you wish to stay at. They provide a fast and effecient service, and you will be sent your voucher and invitation within 10 minutes by email. we would advise you also check out the Hotel prices as they offer a lower cost if you book your Hotel accommodation through their site. You can also book your accommodation with your preferred booking site, and order your visa support seperatly. Submit your application along with the payment for Visa issue. Send this by special delivery to the Visa Consular section of your nearest Russian Embassy. Please be aware that the Russia Consulate will only issue a visa in the country where you are resident, so if you are not in your home country, then applying at a Embassy may not issue you with a visa to enter Russia. it is best to make your application before your start travel.